Tim didn't have to travel far to reach the University of Miami basketball program. The Miami Northwestern High standout came to Coral Gables after earning All-State honors in both basketball and track ! He finished as the Bulls all-time leader in points, rebounds and blocked shots, along with a state record in the high jump (7'2") which still stands ! After completing his Hurricane career, Tim would stand in select company as one of the Canes all time basketball greats. On February 27, 1999, Tim became just the second Hurricane to have his number retired, Number 40, joining Rick Barry's Number 24 jersey in the rafters ! He is the only player to record over 1,500 points, 800 rebounds and 200 blocked shots in a career. He helped Coach Leonard Hamilton's squads to four consecutive winning seasons and three consecutive postseason bids, including the school's first NCAA tournament trip since 1960. The 6-7 forward ended his career ranked fourth on the scoring list (1,713 points), fifth in rebounding (856 rebounds) and 2nd in blocked shots (224 blocks). James, was a two-time First Team All-Big East selection, and was named Third Team All-American by both the Associated Press and National Association of Basketball Coaches, only the 4th player in UM history to garner All-American honors. He received some type of Big East honor all four years, earning All-Rookie Team as a Freshman, 2nd Team All-Big East as a Sophomore, and First Team his final two years ! 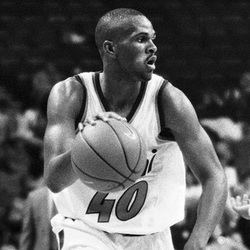 He was named Co-Big East Player of the Year in 1998-1999, along with Connecticut's Richard Hamilton. He was also named Big East Player of the Week five times. During that '98-99 campaign, Miami would tie the school record of 23 wins, and, after defeating #2 Connecticut on the road, the Canes would reach the Associated Press Top Ten for the first time since 1960. Tim was more than just a basketball star...he still holds the school record high jump of 7'-1 1/4" and won the Big East high jump title twice, in 1996 and 1997 ! Off the court, he was a positive influence, being very active in the community, working with the "Join A Team, Not A Gang" program and served as a positive role model, speaking to local youth groups on the importance of staying in school and "Saying No to Drugs". After graduating from UM, Tim became a first round draft pick (25th overall) of the Miami Heat, and spent 3 years in the NBA with Miami, Charlotte and Philadelphia, as well as playing overseas in Turkey, Japan and Israel. He lives with son, Tim James, Jr. in Austin, Texas.